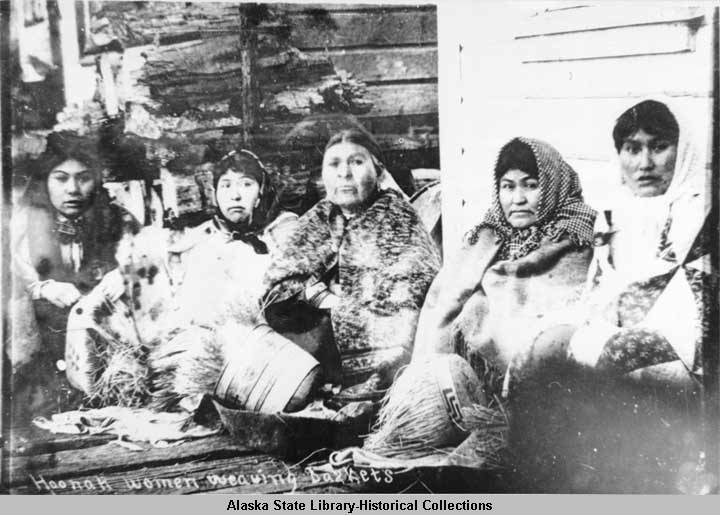 Hoonah Women weaving baskets (undated). Alaska State Library Historical Collections. What would we do if in the year 2020— only a couple years from now—this American culture was suddenly subdued by another culture that believed theirs was the superior way of living, their god was the one true god, their language the only worthwhile speech, their history the only history that mattered? What would happen if this young American society—less than 250 years old—suddenly was rocked by cultural trauma? It’s unthinkable, but let’s suspend our disbelief for a moment to consider what would happen to our grandchildren’s children if i n the span of the next fifty or sixty years a killing blow was delivered to the way of life we now know. What would happen? What would we do? We could no longer speak the English language. Schools, businesses, stores, everything would be conducted in some new language we didn’t understand. Our laws would be swept away. No more regulations, acts of Congress, municipal codes, no more executive tweets, no more laws as we now know them. No more Doctrine of European Discovery. No more American Manifest Destiny. Everything would be done according to some new legal system that we didn’t understand and that was created and enforced in someone else’s favor under a doctrine brought with them from some faraway place, a doctrine that conferred upon themselves the right—the power, the authority, the privilege—to take what they pleased. To subdue. To dominate. To enslave. To teach. 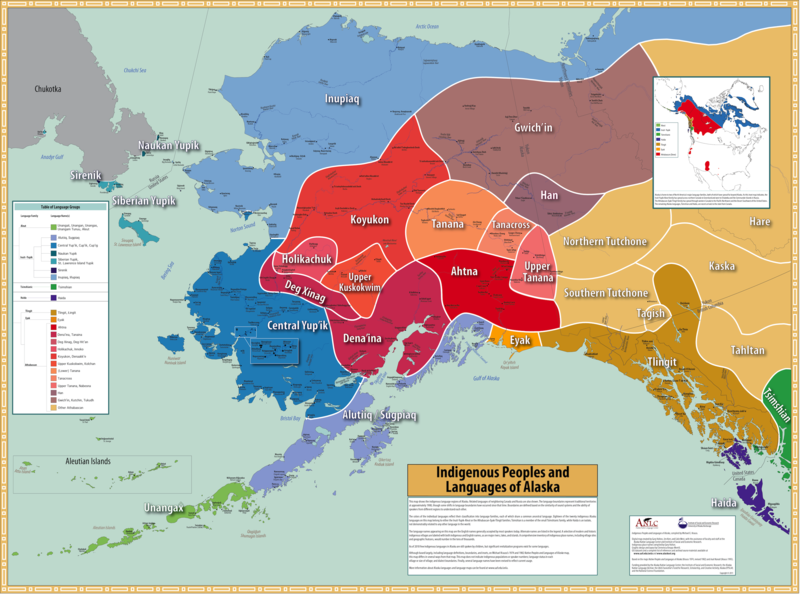 Indigenous Peoples and Languages of Alaska. Alaska Native Language Center, University of Alaska Fairbanks, and the Institute of Social and Economic Research, University of Alaska Anchorage. Our religions would be abolished. Bible studies and communion and concepts like American Exceptionalism would be seen as prehistory. Evil. There would be no more “in God we trust” on our money. In fact, there would be no more money. The new currency would be in the hands of others. Our bank accounts, our property, our belongings, would suddenly be of no value to us, and most of our remaining wealth would be taken. Our standards of beauty would be ridiculed. Our art would be trivialized. Our literature would become folklore and superstition. Our philosophers and great thinkers would be described as unsophisticated, quaint storytellers. All of our place names would be changed. Our own names would be changed. We would be forced to celebrate peculiar holidays. We would be taught the exploits of someone else’s heroes. Our children would be taken from us and sent far away, where they would be forced to forget English, forced to dress in someone else’s fashions, and forced to learn trades that prepared them for servitude. Taken from our influence, they would be given unpronounceable new names in a foreign language, they would not learn the history of their country, and they would receive the strong message that whatever they did, they would never be as good as those who were members of the newly dominant culture. Before long, no one would be learning English as a first language. Before long, our legal and educational and spiritual and social systems and beliefs would disappear. The day-to-day lives of your grandchildren’s children would be characterized by unequal rates of incarceration, unequal rates of educational dropout, unequal rates of parental termination, unequal rates of suicide, addiction, poverty, depression, anger, shame, and all the other inevitable effects of cultural trauma. There would be no lack of reports and meetings and task forces and training devoted to addressing the problems of their failed assimilation. And 150 years after the sudden cultural trauma we can hardly imagine, a statue would be erected that celebrated the hero that brought about the obscene transaction that resulted in that trauma, a monument that effectively erased the occupation, the existence, the value of the American people who had lived in this place for almost 250 years. Lingít x’eináx Saankaláxt’ yóo xat du waa sáak’w. Ch’aak’ naa ayá xát. Kaagwaantaan ayá xát. Gooch hít ayá xát. Gunáx teidí dach xan xát sitée. Yan wa sháa. Shéetka Kwáan. 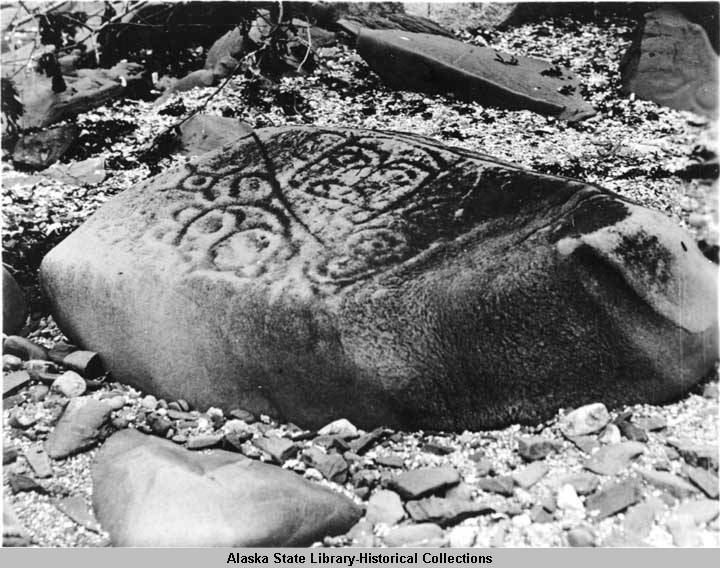 Petroglyph boundary marker, Hoonah Alaska, (before 1741). Alaska State Library Historical Collections. Almost every source describes the long record of Native use and occupation that took place before European contact as “pre-history.” Indigenous groups, however, possess histories of thousands of years of occupancy and exodus, relocation and settlement, exploration and discovery, embedded throughout the generations in legal process, artistic declarations, symbolic regalia, and oral tradition at least as accurately and in many cases more accurately than the European system of writing that has been used for so many years to remove rights and appropriate lands. We must always remember that before colonial contact, Native cultures possessed vigorous legal systems, effective educational systems, efficient health systems, elaborate social orders, elegant philosophical and intellectual insights, sophisticated kinship systems, complex languages, profitable trade systems—every social institution needed for a culture to flourish for thousands of years. We do well to remind ourselves that had the colonial invasion not taken place, Indigenous people would still be living in the twenty-first century. Our lives would still be modern. Paved roads, airports, and electricity would still occur. Some things would be different. We would all be speaking our own languages. Our children would be receiving educations meant to lead to their success. We would not be so vulnerable to incarceration, alcoholism, poverty. We would be healthy. This is the sesquicentennial of Alaska Native resistance. Let us not erect monuments to colonialism but rather to equality. Let us not memorialize nineteenth century separatism but rather twenty-first century unity. Let us not look backward with admiration but forward with hope. Let us not glorify policies that advocate the destruction of other ways of life but let us embrace one another in our shared humanity. In this most perilous time, at this sesquicentennial, let our choice be to turn away from actions that erase the existence and values of other cultures. Let our choice be to acknowledge our equal humanity, to respect our equal humanity, to unite in our shared humanity. When we make those good choices, when we walk forward together, when we admit our shared histories and embrace our shared futures, we are heroes. We are all one another’s heroes. Ernestine Hayes is a Professor at University of Alaska Southeast in Juneau, the author of the memoirs The Tao of Raven, and Blonde Indian (winner of the 2007 American Book Award). She is currently the Alaska State Writer Laureate. This essay is excerpted from Professor Hayes’ presentation for Alaska Division of Libraries, Archives and Museums 2017 Summer Lecture Series. The full talk can be viewed here.